This is the true story of British Hollywood columnist Sheilah Graham (Deborah Kerr, The End of the Affair) and her turbulent relationship with American author F. Scott Fitzgerald (Gregory Peck, To Kill a Mockingbird). They met and fell in love in 1936 and their affair continued until the author’s sudden death of a heart attack in 1940. 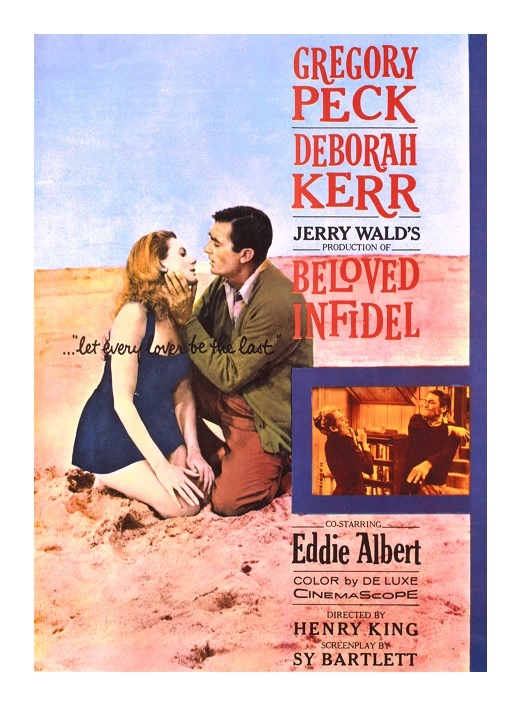 Directed by Henry King (The Song of Bernadette) from a script by Sly Bartlett (Twelve O’Clock High) based upon Sheilah Graham’s memoirs, Beloved Infidel is a glossy, but ultimately emotionally unsatisfactory fact-based melodrama. Beloved Infidel does have a touch of A Star is Born that I liked; Graham’s career rises as Fitzgerald’s career collapses. This time around the familiar scenario has a voyeuristic element because we are dealing with well-known, real-life people. It’s also fun to see Hollywood in the 1930s. Names have been changed, but if you know your Hollywood trivia you won’t be fooled — Eddie Albert (Roman Holiday) and Karin Booth (My Foolish Heart) play thinly-disguised versions of humorist Robert Benchley (I Married a Witch) and actress Alice Faye (In Old Chicago) respectively. I have to say that I’m really surprised that the Production Code allowed the film to be made — this is essentially the story of a married man and his mistress. In her 1985 book Hollywood Revisited, Sheilah Graham talked about her displeasure with the film. Her main point of contention was the casting. She thought Deborah Kerr was too lady-like to play her. She was also very unhappy with Gregory Peck’s performance (she wanted Richard Basehart, He Walked by Night). First, I agree with her about Peck; he is all wrong as Fitzgerald. Peck is just too grounded to be convincing as the shaky, weakly alcoholic author. His drunken scenes aren’t believable — these scenes are funny rather than disturbing. Peck himself said that he had given a bad performance and I agree; this is the very first time I see Peck struggle badly. On the other hand, I thought Kerr was very good. Beloved Infidel is told from her character’s perspective and she does a good job drawing the viewer into her world. I do see Graham’s point. The columnist was known for her snide remarks and Kerr is just too elegant, too refined to properly exude Graham’s famous sarcasm. But Kerr does convey beautifully the desperation of a woman in love with a helpless addict — the lady defines the phrase “grace under fire.” Kerr’s fine performance overrides the clunky script and makes us care about her character’s problems. Flaws notwithstanding, Beloved Infidel looks and sounds great. The film was shot by celebrated cameraman Leon Shamroy (The Black Swan and Cleopatra) in CinemaScope (it’s a beautiful-looking movie!). Franz Waxman (Sunset Boulevard and A Place in the Sun) wrote the soothing music score. The appropriately romantic title song was written by Waxman (music) and Paul Francis Webster (lyrics). 20th Century Fox’s Beloved Infidel tries to follow in the footsteps of Love is a Many-Splendored Thing and An Affair to Remember (all three movies were produced by Fox), but it doesn’t quite make the grade. That being said, Kerr is very good and the film’s subject matter will be of great interest to many people. Color, 123 minutes, Not Rated. P.S. This is my contribution to The Deborah Kerr Blogathon, hosted by Maddy Loves Her Classic Films. This is a film that has its moments, but I’d agree that it is mostly a disappointment. Deborah Kerr is the best thing about the film to be honest. I thought someone like James Mason would have been a better fit for this role, rather than Gregory Peck who seems quite out of his depth. James Mason? Great choice! I’ve seen him play an addict twice — Bigger Than Life and A Star is Born — and he was excellent on both occasions. I can really see him in this role. I think he would have been just as good as he was in Bigger Than Life and A Star Is Born. He could do torment and despair so well. I had hoped for more from this movie which felt too much of the glossy “woman’s picture” without a sincere exploration of the characters. Perhaps someone should revisit the book as a project. Agreed. There is a good movie here. Let’s just hope that someone decides to adapt the book again.